Can I reach my sales representative? Can I track my purchases at a moment’s notice? How can I review your offerings and ask questions? The Customer Portal addresses these needs by enabling customers to serve themselves. What is in the Customer Portal package? The WEF Customer Portal package essentially web-enables the LumberTrackTM ERP system for self service. Responsive design ensures that your customers can view actionable business data and interact with your company from their desktop, laptop or iPad. Recent Invoices, Multiple Locations, Item Stats, and Purchase by Location. The WordPress Enterprise Framework (WEF) has been in continuous development for the past four years. It is being used daily to support both large and small companies, including current LumberTrackTMcustomers. 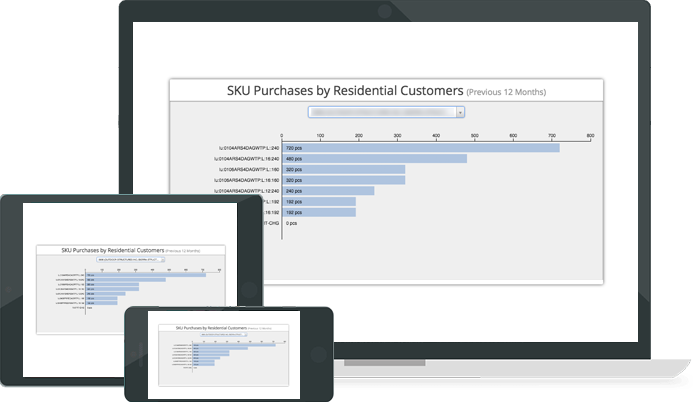 The Customer Portal Pricing package builds upon the Customer Portal by adding Price Sheets, Heat Maps, and Pricing Delivery functions in real time from your customer dashboard. There is no need to distribute price sheets manually. Online Customer Price Sheets -- Select price sheets from your customer dashboard with the click of a button. 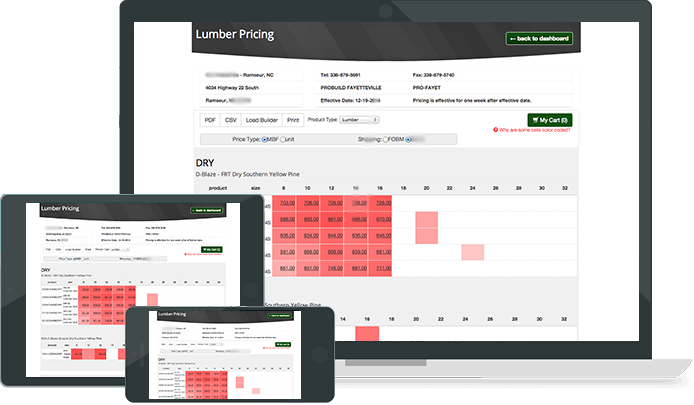 Choose pricing for lumber, plywood, or specialty products. Heat Map -- Color intensity gives an immediate visual of what products have been ordered -- from the most to the least. Displays products ordered over a date range in general or by location. Pricing Delivery - Price sheets can be delivered by email or fax. Select from internal or external distribution. The WEF Customer Portal Online Ordering package allows customers to submit orders online from their computer, iPad, or mobile phone. Online ordering is powerful. When you enable your customers to serve themselves, you save your company time and money, and needless headaches. 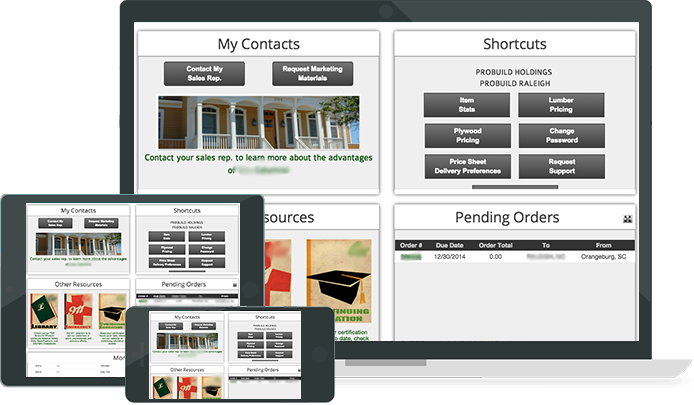 When your company depends on sales, you expect much from your ordering system. It must be reliable, secure, and user-friendly. And, to compete in today’s economy it must be available online. Still using a slow Manual Ordering process? For most LumberTrackTMcustomers, placing orders is still time consuming. Orders have to be faxed in, called in, or submitted in person. You have to call customer service for order status, invoice questions, and even to update your contact info. Imagine what this is like for a company with plants and distribution centers across many states! 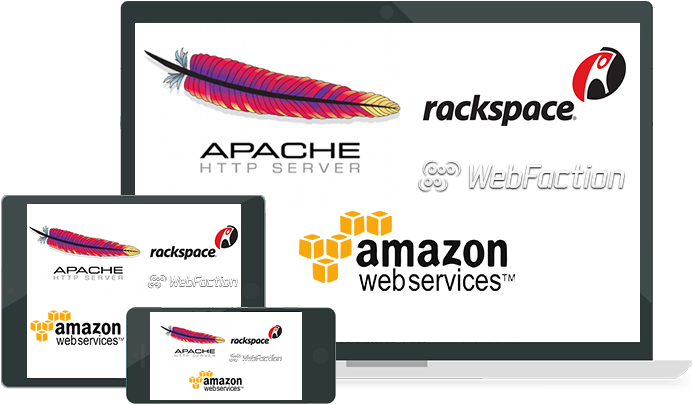 The WordPress Enterprise Framework provides online ordering capability for LumberTrackTM. Ordering is now available online, 24 x 7. Select a price sheet(s) for lumber, plywood or specialty products and indicate for pickup or delivery. Add your desired due date and purchase order number. Check order status easily on your mobile phone or iPad. WEF Online Ordering boosts productivity! WEF Online Ordering makes sales easier! WEF Online Ordering has an immediate monetizing impact! 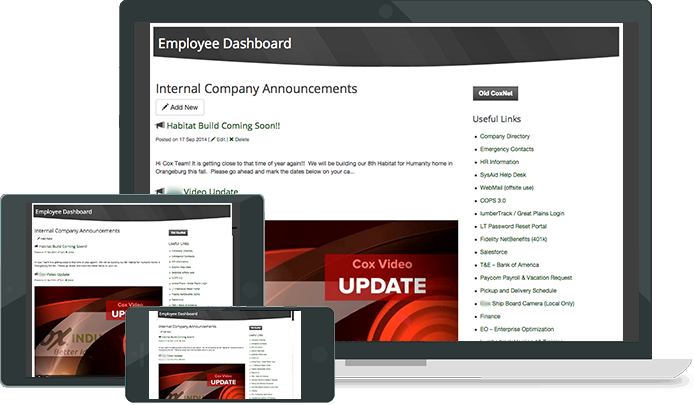 The Basic Employee Portal allows employees to log in to manage features and view dashboards. Custom dashboards can be built from WEF’s broad menu of applets and widgets. Selection will depend on which member groups the dashboard will serve. Typical groups are administrators, managers, accounting, sales representatives, customer service and inventory management. 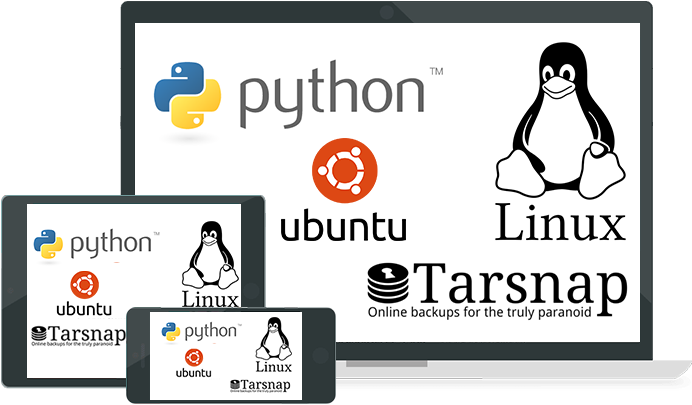 WordPress Enterprise Framework works hand in hand with LumberTrackTMto make your life easier. This applet ranks your customers based on the ratio between their accounts receivable and their total available credit. It provides a summary widget for inclusion on a dashboard and a detailed report when expanded. Widget includes X customers ranked by highest AR/Credit ratio. Detail applet provides access to all customers in filterable/sortable report. This applet lists your customers who are over their credit limit. It provides a summary of how much they are over their limit in real time. This allows you to see trends and take appropriate action. Widget includes X customers ranked by highest AR Over Credit ratio. Detail applet provides access to all over credit customers in filterable/sortable report. This applet lists customers who have overdue payments. It provides a summary widget for inclusion on a dashboard and a detailed report when expanded. Widget ranks X late customers by highest degree of late payment amount per month. Detail applet provides access to late customers in filterable/sortable report. This widget summarizes customer’s Credit Limit, AR Balance, Highest AR, Highest AR Date, Sales for the Last 12 months, and Default Payment Terms. This widget is available for inclusion on a dashboard and a detailed report when expanded. Widget provides a summary snapshot of key credit related customer information. 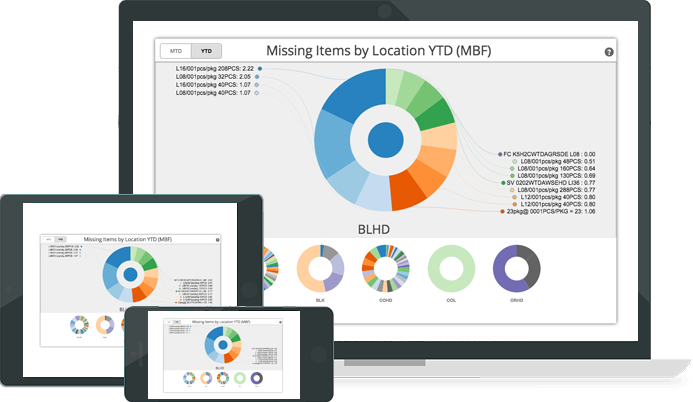 Provides actionable data and trends based on the latest summary statistics. This widget lists a customer’s outstanding balance by the previous 0-30, 31-60, 61-90, and 91+ days. Widget shows what the customer owes in the last one, two, or three-month periods, or beyond. This widget provides a list of the last five paid invoices including: pay date, due date, pay days, amount due, invoice number, invoice type, and terms. Displays a summary list of the last five paid invoices. This applet displays a bar chart of invoice pay days for the last 20 invoices. It provides a summary widget for inclusion on a dashboard and a detailed report when expanded. 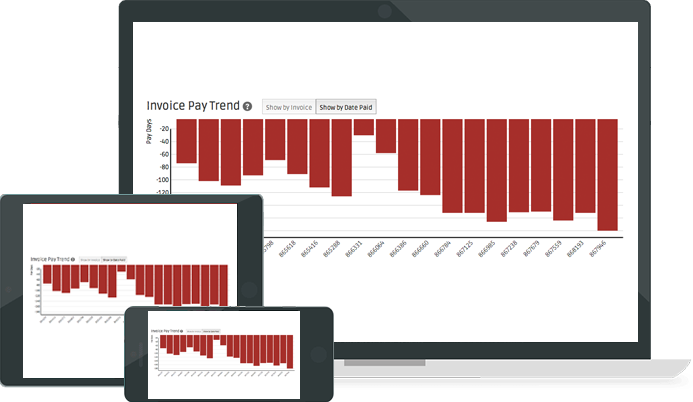 Widget shows a 20-invoice trend of pay days. Filter by Invoice or by Date Paid. 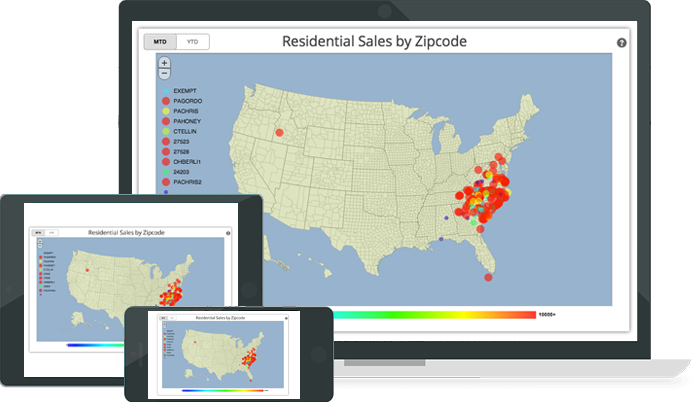 This applet is a heat map that displays all customer sales geographically by zip code. It provides a summary widget for inclusion on a dashboard and a detailed report when expanded. Widget includes sales broken out by zip code. Detail applet provides access to all customer sales in filterable/sortable report. 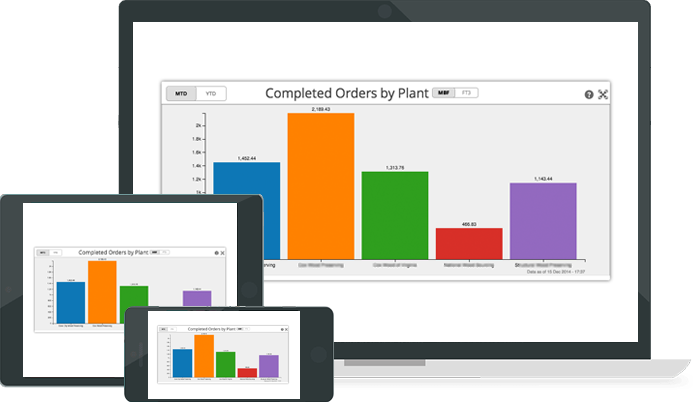 This applet shows a bar chart of completed orders by location. Display in MBF or FT3. Filter by MTD or YTD. 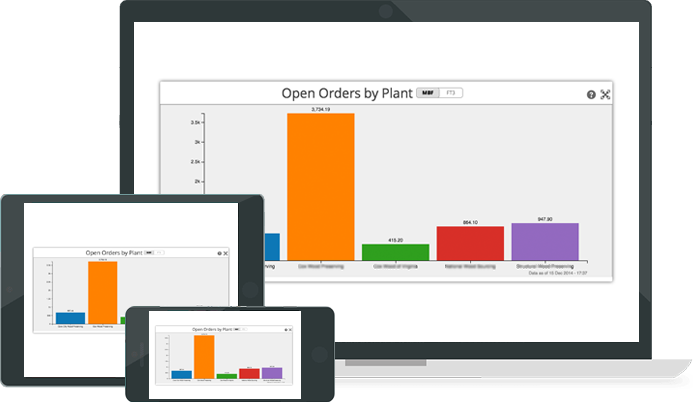 This applet shows a bar chart of open orders by location. Locations are displayed in different colors. 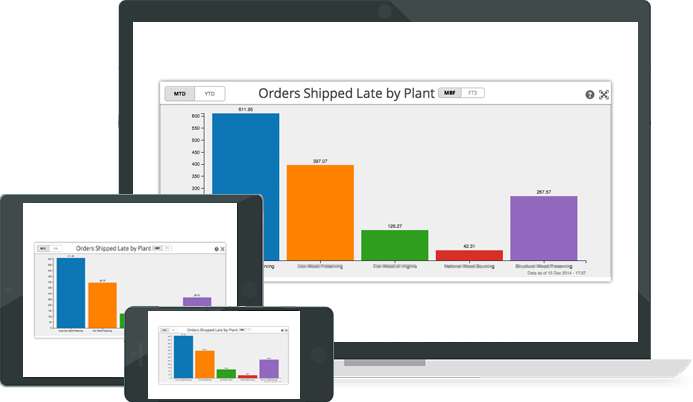 This applet shows a bar chart of completed late orders by location. This applet shows a bar chart of open late orders by location. This applet displays a color-coded bar chart showing margin by location in percentage. 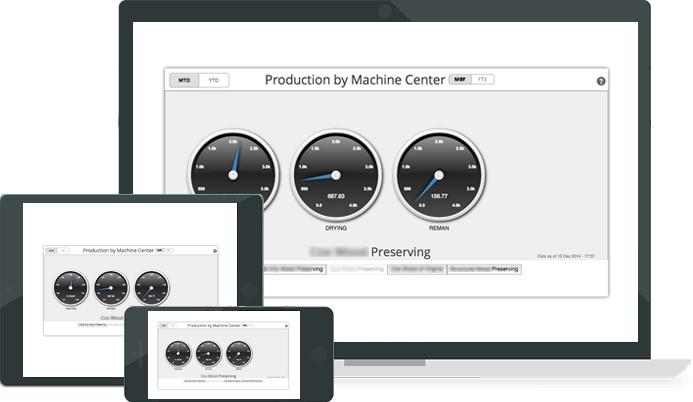 This applet provides a set of gauges showing product treated by each machine center. Gauges display treating, drying, and reman. Choose either MBF or FT3. This applet is a line chart showing chemical usage by location in dollars. See chemical usage for one location or multiple locations at a glance. This applet shows a bar chart of released invoices by location in dollars. Locations are shown in different colors. This applet is a set of color-coded donut charts showing completed invoices in dollars by customer for each location. This applet correlates sales orders against invoices. It shows accuracy by percentage. Shows percentage for 7 days, MTD and YTD in one display for easy comparison. This applet uses a color-coded donut chart to show SKUs ordered but not shipped. This applet uses a color-coded donut chart to show SKUs ordered but not shipped by location. Displays selected location along with thumbnail images of other locations. 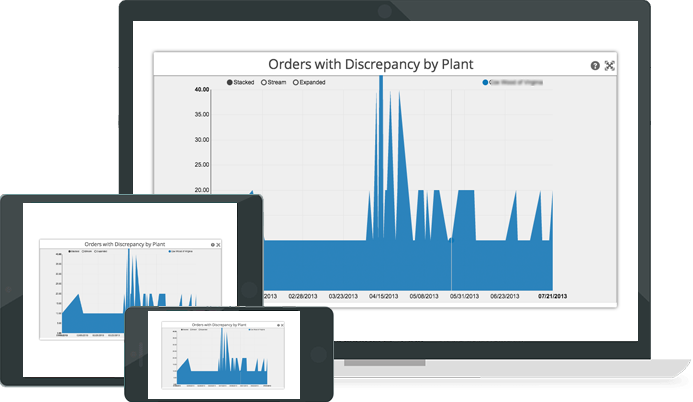 This widget displays a stack chart showing orders with discrepancies YTD by location. Select from Stacked, Stream, or Expanded. This applet provides a tabular view showing total number of orders and orders with discrepancies by location for the previous seven days, MTD, and YTD. 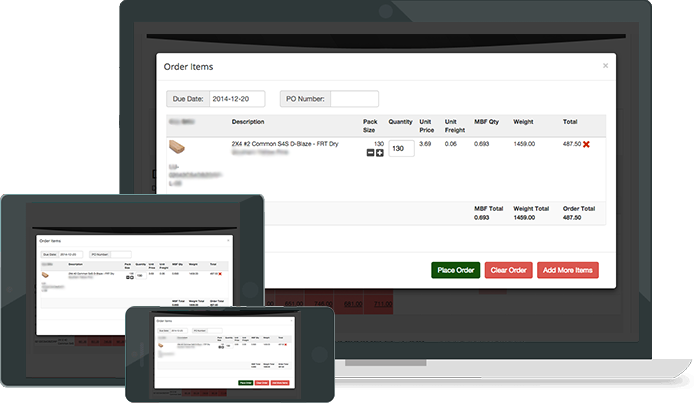 Click “View Orders” for detail data for any order with discrepancies. This applet provides a tabular view showing total number of orders and orders with discrepancies by Ship To for the previous seven days, MTD, and YTD. This applet shows pending orders. Shows Location, Order #, Due Date, Order Total, To, and From. Click on Order # for detail view. Monthly Stats applet shows monthly purchase totals in MBF, FT3, and dollars. This applet displays a color-coded donut chart showing purchases in dollars by Ship To address. This applet is an accordion table showing all invoices by Ship To for the previous two months. Click on Invoice # for individual invoice detail. 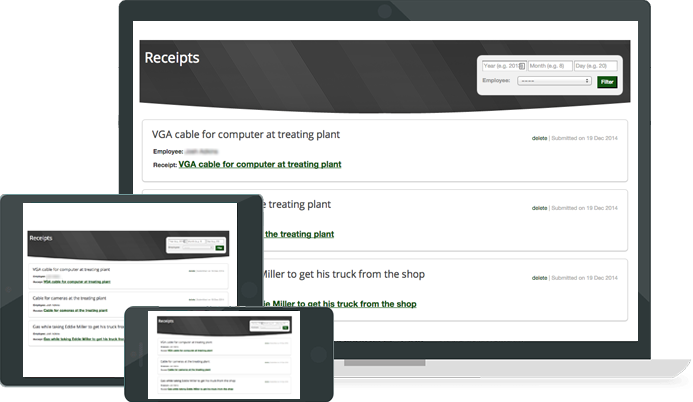 This applet provides a view of invoice details. Shows Product ID, Product Description, Pieces Quantity, Sales Price, Subtotal, Total, and more. This applet provides a complete view of customer order details. This widget allows you to include links, explanatory text, or other static HTML content in your dashboard. The Static HTML Widget provides support for presenting and editing static HTML in widget form. Allows for an unlimited number of static HTML widgets to be presented on any dashboards. Participates in WEF security, can be shown or hidden based on users’ group memberships. This set of applets allows you to display active links, explanatory text, and dynamic and static HTML content on your dashboard. The Static HTML Widget provides support for presenting and editing static HTML in widget form. Dashboard content displayed is based on the user’s group membership. 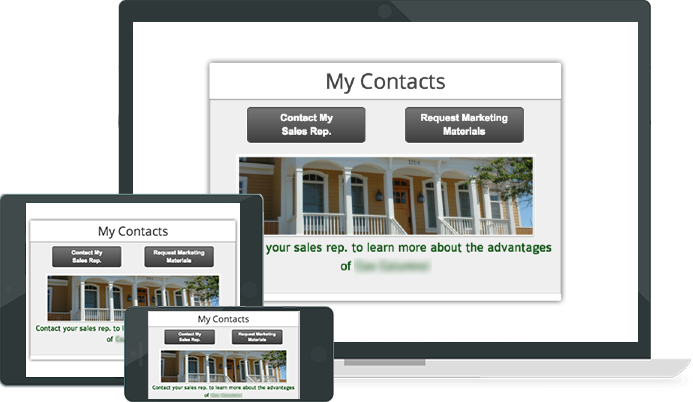 Provides visibility to the customer of what they have been ordering. They can also see what products they have not been ordering but might need to order and stock up on. Provides visibility to the sales person on what the customer has not been ordering, allowing the opportunity to upsell. WEF’s Active Directory Authentication is a custom WordPress plugin that allows WordPress and Active Directory to talk to each other. When users log in to their web portal (WordPress), the local groups and information are synced with the WordPress online data. Syncs brilliantly with Microsoft Security. Provides a fully featured system without the hassles of complex systems like SharePoint. Easily manages who sees what based on users’ group memberships. This option allows for streamlined authentication and user management from your LumberTrack login. 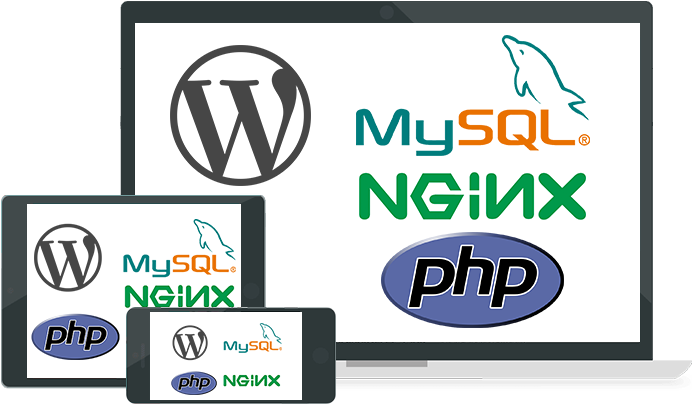 Highspeed WordPress Hosting, MySQL, nightly backup, server maintenance, virus/hacking protection, and uptime monitoring.